This articles provides a detailed explanation of the menu items for our Mac and Windows desktop apps. The desktop controls are broken down into 5 areas, separated by horizontal dividers. This section displays your username, and session status. There is some variation between our Mac and Windows clients. Sync Freedom: Manually sync blocklists and sessions. This section will allow you to start a Freedom session directly from your desktop menu. Select Devices: Choose devices for the session. Select Blocklists: Choose blocklists for the session. Start a Session: Start session with selected devices and blocklists. Schedule a Session: Managed scheduled sessions. This section allows you to control the Freedom app's behavior. Manage Blocked Desktop Apps: Opens a list of desktop apps that you can block with Desktop App blocking. Note: Apps need to be running to populate on this list. Options → Start at Login: When enabled, Freedom will start at login. Options → Disable Quit During Sessions: When enabled, Freedom will prevent you from quitting during a running session. 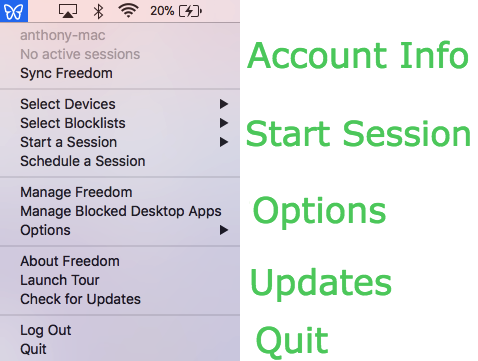 Options → Disable Activity Monitor During Sessions (Mac Only): When enabled, Freedom will prevent you accessing Activity Monitor so you cannot manually quit the app during an active block session. 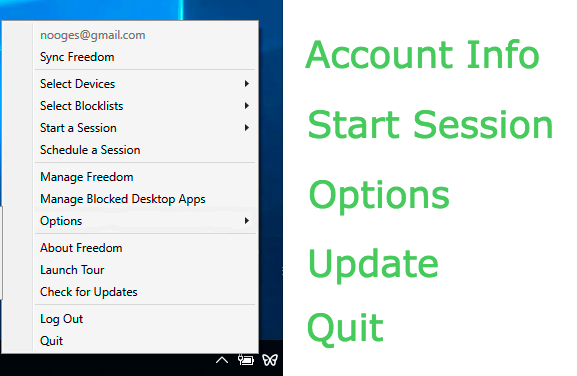 Options → Disable Task Manager During Sessions (Windows Only): When enabled, Freedom will prevent you accessing Task Manager so you cannot manually quit the app during an active block session. Options → Advanced Options → Block Everything: (Mac only) If selected, all network connectivity is blocked during "Block everything" sessions. Options → Advanced Options → Block Email and Chat: (Mac only) If selected, desktop email and chat programs will be blocked during any kind of session. Options → Advanced Options → Kill Blocked Apps: (Mac only) If selected, blocked desktop apps will be force quit instead of hidden. Please use with caution, as quitting may potentially cause unsaved work (email drafts, etc.) to be lost. About Freedom: Displays current version number. Launch Tour: Launches a setup guide. Update Freedom: Checks for updates. Sign out: Logs out of the client (useful for switching users).